Central themes coalesce around the acoustic and spiritual act of tuning, of finding elements of alignment or harmonics within randomness, crystallized in the experience of the recent total solar eclipse. The sonic-scape of Tuning Fork explores a process of frequency scanning amid the vast interstices of vibrations alternately discovering then losing, finding again – signal. This sonic brew provides the medium from which the story is tuned. Shifting tones of the narrative arc delineate a journey to the central trajectory of the total solar eclipse that raced coast-to-coast across America in August of 2017. 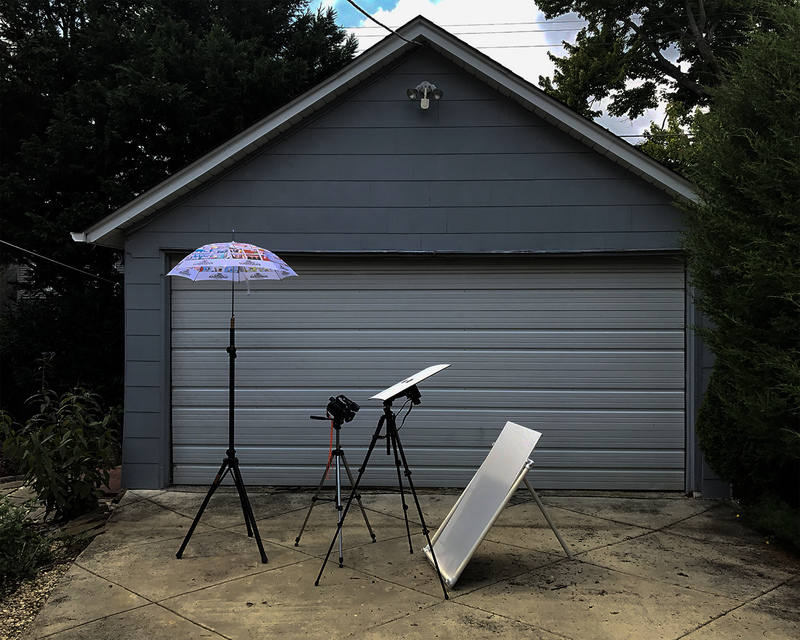 Above image is an installation by Bradley in his backyard used to document the partial solar eclipse 2017. Stephen Bradley and John Sturgeon have collaborated in creating sound art works, as well as streaming events and performances, nationally and internationally for over 16 years. Mutual interest in spatial aspects of surround-sound, the communal power of storytelling and a history of creating unique sonic environments inform both the content and structure of Tuning Fork. The shifting narrative arc delineates a journey to the central trajectory of the total solar eclipse that raced coast-to-coast across America in August of 2017.